Chinese company Meizu is expected to unveil its next flagship smartphone, the MX5, on June 30. A launch event has already been confirmed for that date and invitations have been send to the local media. We also know that the MX5 will feature a metal body, courtesy to some pictures that leaked a few days ago. Last but not least, the latest rumors claim Meizu's high-end smartphone will be launched in China for just 1,799 yuan, which is about $290. Some of the phone's specs have been leaked as well, but these leaks haven't been followed by any confirmations from the Chinese company. 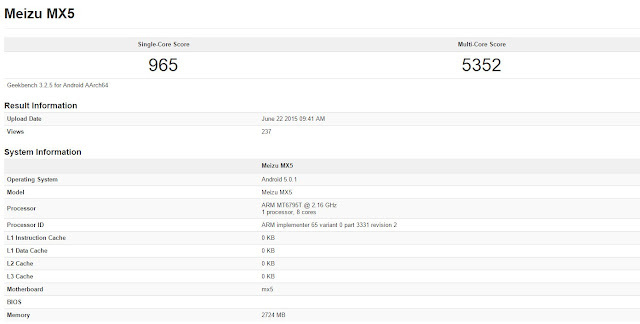 Well, it looks like a benchmark of the Meizu MX5 that's been recently spotted in Geekbench shows the smartphone is capable of great multi-core performance. Unfortunately, things are a bit different when it comes to single-core performance, but rest assured that you won't experience any lags while browsing the phone's menu. 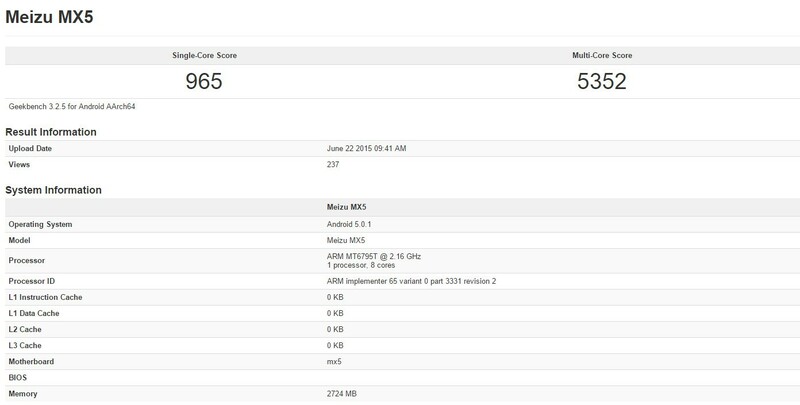 Meizu MX5 will be equipped with a 64-bit octa-core MediaTek MT6795T Helio X10 processor, which scored no less than 5352 points in the multi-core benchmark. That's close to Samsung's Exynos 7420, which is considered one of the best processors available on the market. Qualcomm's Snapdragon 810 is nowhere near this performance and that's probably due to the chipset's overheating issues. When it comes to single-core performance, the Meizu MX5 shows disappointing benchmark results, way below Samsung's Exynos 7420. Nevertheless, it's good to know that Meizu MX5 will perform decently in any condition, thanks to it high-end specs sheet. Speaking of which, the MX5 is expected to pack 3GB of RAM and a 20-megapixel camera on the back. The smartphone is said to feature a 5.5-inch capacitive touchscreen display that supports full HD (1080p) resolution, and a non-removable 3,150 mAh battery.